Been wanting to try a "new" place, on a budget? Dine LA Restaurant Week is coming up quick! January 27 - February 1 and February 3- February 8, (note it does not include Saturday night) you can try find 3 course prixe-fixe meals at restaurants all over! Lunch is $15-25 and dinner $22-34. Now granted there are some I wouldn't walk into for free, like Twin Palms, but there are some that I would love to try! There are several San Gabriel Valley choices. Here is the list of participating places, by region. 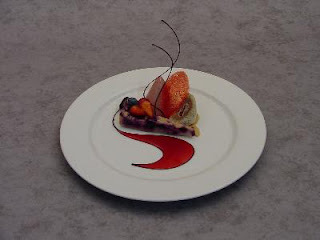 Many of them also have the menus that they will be serving on-line. I suggest making reservations now, (reservations available to the general public starting 1/16) However if you are an American Express Card member you can make reservations today! Dine in LA week is supposed to the promote extraordinary diversity and culinary expertise found in Los Angeles, however it also promotes expanding your waist, and breaking that New Years resolutions to cut back. I decided with a New Year a new look was needed. It has been a year since I began this blog. Although it has been quiet the last few months I intend to change the format a bit this year and include adventures from my little red kitchen. So not only will I continue with my rants and raves, but I will include my own cooking adventures. I love a good breakfast. 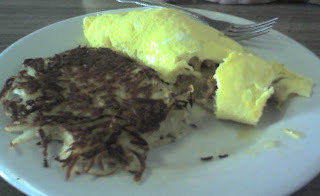 I especially love spinach omelets and have not found very many places that serve them and can get all the components of the breakfast right; a nice fluffy omelet with fresh spinach, crunchy hash browns that are not mushy in the middle, good coffee and toast. Another must is that you can go to the place after rolling out of bed and putting on your sweats and throwing your hair into a pony tail and feel like you belong. So that rules out several breakfast places. I happened upon this little hole in the wall a couple years ago. It’s a few blocks north of Colorado on Holly Street, open until 3 in the afternoon and only takes cash. It has been there a while and the décor shows it. Ernie owns the place and will probably seat you, take your order and wait on you too. The menu consists of an odd variety of selections, breakfast foods, lunch sandwiches and burgers and some Chinese offerings. You could probably walk into the place with your jammies and no one would bat and eye (perfect for the morning after). My favorite on the menu are the omelets. They are fluffy and filled with your selection of yummies. 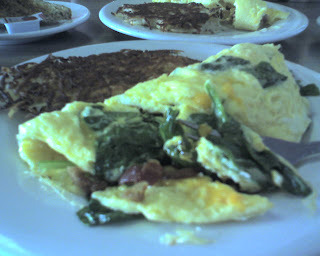 I love the spinach omelet, inside is melty cheese and pieces of crispy bacon. The spinach is fresh and is cooked into the egg and is perfect. The hash browns are crispy on the outside and perfect on the inside, no mushy stuff here. They also make a killer corned beef hash, if that is your thing. Sometimes it’s hard to find straight hash on the menu. There are all those hash variations that include things like, pesto or sun dried tomatoes, or some other trendy ingredient that completely ruins corned beef hash. Pancakes are stellar too. I stay away from the benedict since I am a hollandaise snob and the stuff here doesn’t cut it for me. 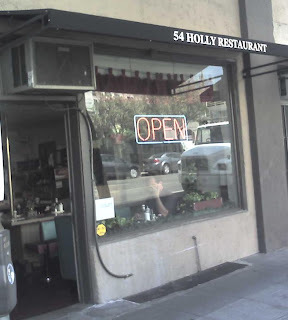 Go try 54 Holly. It will take you back in time. Say hi to Ernie for me. There are few franchised eating establishments that dot the southern California landscape worth mentioning in a food blog. As you might guess the majority of these would be fast food. 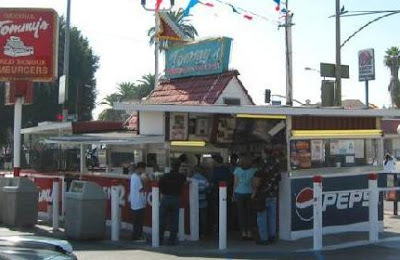 In-n-out and Tommy’s are two that come to mind, that might be considered institutions, perhaps maybe even iconic. 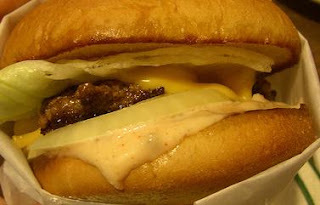 Lately, after not really enjoying the sandwich known as a burger most of my life, I have come to a term of endearment with the in-n-out cheese burger and indulge myself on rare occasions, and even more recently I have started to crave a burger that I once had in college. A little place over on Beverly and Rampart that we would drive to after the UCLA football games at the Coliseum, (I know I am dating myself once again). 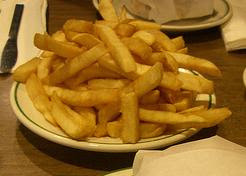 Tommy’s. I would stand in line and order mine, no onion no mustard and watch the big Samoan guy scowl at me for the special request, but dutifully make it for me non-the- less; the greasy cheesy chili mess all over my hands which later had to be washed with soap to remove the orange stains (from the grease and chili), a super thick slice of tomato, crisp pickles slices, and no mustard. Today I indulged myself once again. Not living near, or wanting to drive to the “Original” Tommy’s. I decided to try one that was on my way home from the office. I assume they would all be as good, as conscientious about your burger, even with a scowl, the Samoan made mine right every time. I drove through, Cheeseburger grilled onion, NO mustard. The cashier repeated my order to me and handed me a bag that was already beginning to turn a faint orange color on the bottom. By the time I got home to eat the thing, I had worked myself into a Tommy burger froth. I found my camera do document the blessed event, carefully unwrapping and photographing the mess. Next I decided to cut the burger, since you really couldn’t see the inside from the frontal shot. I cut the burger in two and separated the halves, licking the knife in anticipation of my first bite. I removed the bun and yes, it was there, bright yellow, I took off the tomato, the pickle, and scraped off the onion until no yellow was to be seen. What was left? 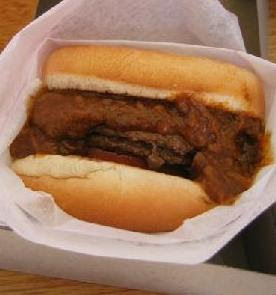 Chili, burger and cheese; I had a pink pit bull begging at my feet. I considered giving her what was left, half a bun, burger and chili, but I was hungry, so I knife and forked most of the remainder. I had heartburn by the time I was halfway through, probably more from the disappointment than from the food. The pretty pink pit bull shared the second half with me, I wonder if she got heartburn too. Such an anti-climactic journey back in time, maybe one day I will journey back to Rampart and Beverly. I am sure the big Samoan who made sure there was no mustard on my burger 20 years ago is long gone, but hopefully replaced with someone just as conscientious, who maybe doesn’t scowl. 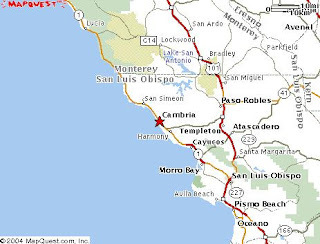 Heading out to taste the wines of the Edna Valley and Paso Robles area, and to eat some of the food of the region too! Will be back with some non-local reviews of the food and wine. I grew up in Pasadena. Third generation, my grandfather worked for Cal-Tech then JPL, and my grandmother was in the women’s club, my father was and engineer at, well you know, that big building. I spent too much time at Bullocks on Lake Street, and cried when Macy’s bought it. I couldn’t believe it when Saks closed, wasn’t there enough rich old ladies in Pasadena to keep it going? I remember the Haagen Daz, and Jergens. Fast forward several years. Notice in the above paragraph I did not mention the place, you know the place that everyone talks about. Its probably because I was a vegetarian for 8 years, them moved away for 10, and now that I have been back in the Dena for 10 years, someone had to drag me to a Pasadena icon. Gee how could I have ever missed the place? I met my S.O. for lunch, I was shopping on Lake Street, yea, I have come to terms with Macy’s, and I actually like Ann Taylor! So I had worked up quite a hunger. We decided to go to Pie n Burger. He was appalled that I had not been there, and I call myself a native. The place was busy; as I am sure it usually is at lunch. It was much smaller that I thought, with just a few tables and a counter. The menu is basically on the wall. Everything right there, it takes you back a few years too, Lo Cal plate, when is the last time we heard that. I started to consider something other than a burger, a grilled tuna? chefs salad? and quickly snapped out of it. 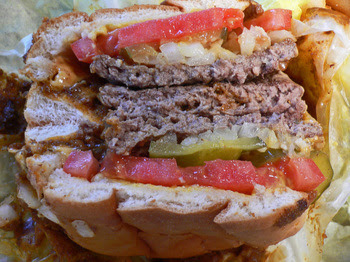 Cheeseburger, NO thousand, pickle, lettuce, tomato and grlled onion; thank you, my S.O. had hamburger with the works, drippy, messy, apparently delicious Thousand Island homemade on the premises. Well, I was not disappointed and snarfed up every last bite of the hand made patty with the perfect amount of melty cheese, and french fries. The size is just right; you can get your mouth around the thing, barely. The charm of the place is that it takes you back, the kitchen is right in front of you and you watch everything being made, the waitresses have been there forever and seem to know everyone, except me of course, even my S.O. was recognized. He probably is a closet Pie 'n Burger fanatic but wouldn’t let on. Oh, and the pie, not that I had room for any, well just a bite, boysenberry, yum. My suggestion is to go off peak times so you don’t have to wait and get ice cream with the pie. Yum. Several months ago I started reading a site called Chow. This site is amazing for anyone interested in food, like me. 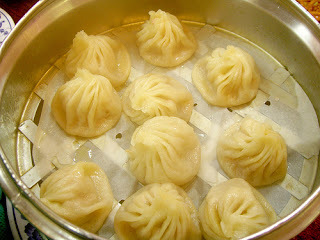 After reading so much about something called xiao long bao, XLB, or soup dumplings, I began to salivate, to dream about this comfort sounding food, to wonder what the taste would be like. A steamed dumpling of pork and crab, some type of gelatinous stock so when steamed it melts into a bit of soup in the dumpling. Now I am as white as they get and my past experience with Chinese food is pretty lame, and had no idea wht to expect. But I decided to try these little gems. A few weeks ago I made the trek down to Valley Blvd. I was hooked. So hooked that I actually dreamed about the dumplings that night. So when the opportunity to take a crowd to this place came up, to order lots of variety, to taste the little bundles of joy once again came up, I jumped on it. Today I went to Mei Long Village for the second time. There were 8 of us so we were able to order a variety of dishes to try. I loved all of them, but my favorite is still the XLB - Soup Dumpling. I can't get enough of these, by the end of the meal we had consumed 5 orders of them! All in all we ordered hot and sour soup, pork pump, lamb with green onion, black pepper beef, orange chicken, jade shrimp and the crab and pork dumplings and some vegetable dumplings too. It was amazing. We all enjoyed the food, even the less adventurous enjoyed it so much they were willing to try things that they would not normally eat. We celebrated my sons 19th birthday. Several of his friends were with us and at the end of the meal there was nothing left to take home. I asked the waitress if the XLB would travel and how an order to go would hold up, she said it would not be a good idea, so we had one last order! The people there were nice, some spoke english which helped, one of our group asked for a fork and the waiter giggled so hard we all had to just crack up! I am hooked on those lovely bundles of joy. My new obsession. Thank you Chowhounders for telling me about this wonderful place! A new obsession.